Call me strange, but I don’t exactly know what time is. I do know that I’ve been a slave to it for much of my life. My life, like yours, is filled with so much: things I want to do, things I need to do, and a lot of things I don’t really want to do but must. There’s always a race against the clock, which leaves me feeling scattered and torn, like a scarecrow with his stuffing pulled out. At the end of the day, there isn’t much left, and what’s left doesn’t feel like me. I assume that you’re a busy professional and you’re not looking for extra things to do. Life is busy enough with work, but when you layer on the more important things like faith and family, there’s no wiggle room, no gaps where you can sneak in a major project like writing your book. And yet it’s something you want to do. You want to make a difference. You actually have the time to do the things you want to do like write your book if you learn to organize your time. 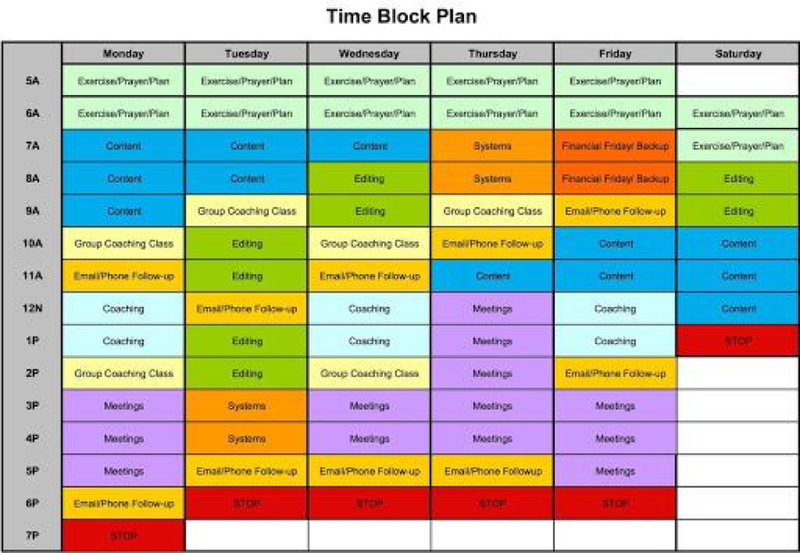 I use a method for organizing my time called time blocking. Time blocking is exactly what it sounds like. It’s organizing your time in blocks so you can be most efficient—not just in your writing but in everything you do. It requires you to look at all your responsibilities and organize them into specific blocks of time so you can accomplish everything on your plate. When I was first introduced to time blocking, I thought, Good grief! I’m going to have to get up at 5:00 every morning to get everything done! I don’t suggest that your weeks be as long as mine are but, on the other hand, if they need to be while you’re writing your book, then so be it. Notice how I block my time. You can see that I devote blocks of time to my tasks—not just fifteen minutes here and there. I organize my time so I fully complete one thing before moving to the next. Take a look at the blocks called content. I often say that books don’t write themselves—and guess what? The classes and workshops I teach don’t write themselves either. I have to schedule time to plan, write, deliver, and produce my classes and presentations. So I figured out how much time I needed per week to do that writing and allocated it across the week in specific blocks. While I’m working on content, I’m not answering the phone—it’s turned off. And I’m not checking email. I close it so it doesn’t ding me to death. And I’m not futzing around online, either. I’m writing content, and that’s the only thing I’m doing. I don’t believe in multitasking. I can hear you say, “Well, of course, you can block off time to write. That’s your business.” And you’re right! But if I want to take care of myself physically, emotionally, and spiritually, I have to start my days at five in the morning to get in that extra activity. Do you think I want to get up that early? I really don’t. But taking care of the other parts of my life is a priority, so that’s what I do. To write your first draft, block five hours each week for sixteen weeks. That’s four months to your first draft! When you keep your eye on the prize, writing your book suddenly seems more doable. What about you? 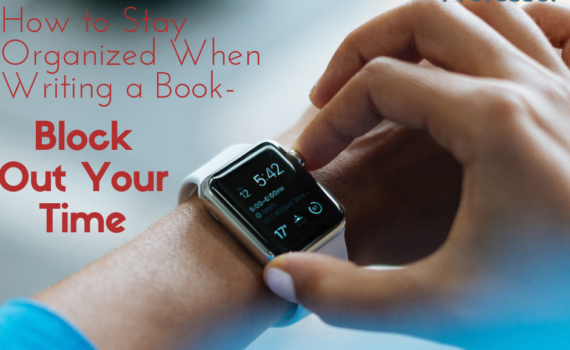 Now that you have the tools to block out your time, what’s stopping you from writing your book? Contact us today and we can help you take the next step!